meridian. If the equinox were fixed in position the sidereal day as thus defined would be the true rotation period with reference to the fixed stars, but since the equinox has a slow (and variable) westward motion caused by the precessional movement of the axis (see Art. 8) the actual interval between two transits of the equinox differs about os.oi of time from the true time of one rotation. The sidereal day actually used in practice, however, is the one previously defined and not the true rotation period. ¿This causes no inconvenience because sidereal days are not used for reckoning long periods of time, dates always being givfen in solar days, so this error never becomes large. The sidereal day is divided into 24 hours and each hour is subdivided into 60 minutes, and each minute into 60 seconds. When the vernal equinox is at upper transit it is oh, or the beginning of the sidereal day. This may be called " sidereal noon." The sidereal time at a given meridian at any specified instant is equal to the hour angle of the vernal equinox measured from the upper half of that meridian. 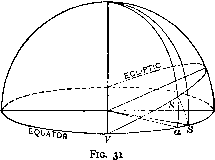 It is therefore a measure of the angle through which the earth has rotated since the equinox was on the meridian, and shows at once the position of the sphere at this instant with respect to the observer's meridian. A solar day is the interval of time between two successive lower transits of the sun's centre over the same meridian. The lower transit is chosen in order that the date may change at midnight. The solar day is divided into 24 hours, and each hour is divided into 60 minutes, and each minute into 60 seconds. When the centre of the sun is on the upper side of the meridian (uppe* transit) it is noon. When it is on the lower side it is midnight. The instant of midnight is taken as oh, or the beginning of the civil day. The solar time at any instant is equal to the hour angle of the sun's centre plus 180° or 12 hours; in other words it is the hour angle counted from the lower transit. It is the,angle through which the earth has rotated, with respect to the sun's direction, since midnight, and measures the time interval that has elapsed. Since the earth revolves around the sun in an elliptical orbit in accordance with the law of gravitation, the apparent angular motion of the sun is not uniform, and the days are therefore of different length at different seasons. In former times when sun dials were considered sufficiently accurate for measuring time, this lack of uniformity was unimportant. Under modern conditions, which demand accurate measurement of time by the use of clocks and chronometers, an invariable unit of time is essential. The time ordinarily employed is that kept by a fictitious point called the " mean sun," which is imagined to move at a uniform rate along the equator,* its rate of motion being such that it makes one apparent revolution around the earth in the same time as the actual sun, that is, in one year. The fictitious sun is so placed that on the whole it precedes the true sun as much as it follows it. The time indicated by the position of the mean sun is called mean solar time. The. time indicated by the position of the real sun is called apparent solar time and is the time shown by a sun dial, or the time obtained by direct instrumental observation of the sun's position. Mean time cannot, of course, be observed directly, but must be derived by computation. The difference between mean time and apparent time at any instant is called the equation of time and depends upon how much the real sun is ahead of or behind its average position. 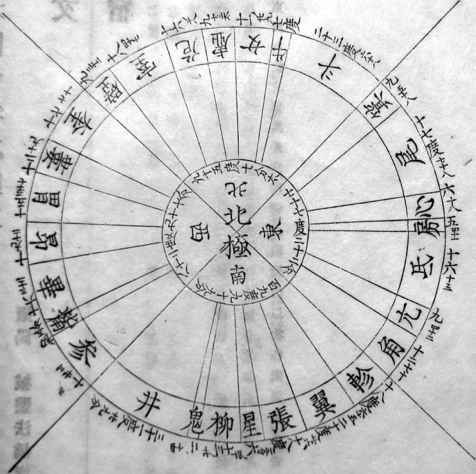 It is given in ordinary almanacs as " sun fast" or " sun slow." The amount of this difference varies from about —14m to +16m. * This statement is true in a general way, but the motion is not strictly uniform because the motion of the equinox itself is variable. The angle from the equinox to the " mean sun " at any instant is the sun's " mean longitude " (along the ecliotic) plus small periodic terms. The exact interval is given in the American Ephemeris and in the (small) Nautical Almanac for specified times each day. This difference between the two kinds of time is due to several causes, the chief of which are (i) the inequality of the earth's angular motion in its orbit, and (2) the fact that the real sun moves in the plane of the ecliptic and the mean sun in the plane of the equator, and equal arcs on the ecliptic do not correspond to equal arcs in the equator, or equal angles at the pole. the earth will therefore be slower. This delays the instant of apparent noon, making the solar day longer than the average, and therefore a sun dial will " lose time." About April 1 the sun is moving at its average rate and the sun dial ceases to lose time; from this date until about July 1 the sun dial gains on mean time, making up what it lost between Jan. 1 and April 1. During the other half of the year the process is reversed; the sun dial gains from July 1 to Oct. 1 and loses from Oct. 1 to Jan. 1. The maximum difference due to this cause alone is about 8 minutes, either + or —.